Alexander Rodin is a contemporary artist from Belarus. Alexander Rodin is known for his large-sized canvases full of jaw-dropping details. 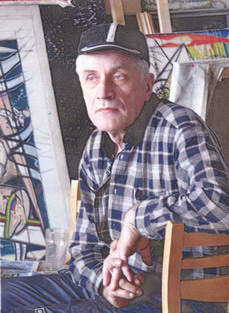 He resided at Kunsthaus Tacheles, Berlin, Germany for 12 years. Alexander Rodin's paintings are an event quite unexpected for Belarusian art with its ideological taboos and conventional norms. The art composition in his paintings is based upon the multi-faceted reflections of infinite spaces. The latter undergo constant changes of urban, geological, technocratic and biological nature. And in order to take them to a single image-bearing system Alexander chooses a high panoramic point of view and uses practical monochrome colors of various tonalities. Alexander Rodin is an experimentalist in his nature and never repeats himself in his works. In his creative search he resembles Wassily Kandinsky and seeks to develop a certain philosophical composition. Alexander himself says that “…an audience needs some nerve! If an artist has it in his works, if he is stripped and palpable then the audience sees and understands that. I work in a manner that’s unfortunately moved to the background now; it has been substituted for coloring and graphics. I combine avant-garde forms and introduce constructivism and cosmogonism…and through the plasticity of the rhythms and color structures I try to juxtapose the micro and macro cosmos of mental, physical and astral being”. 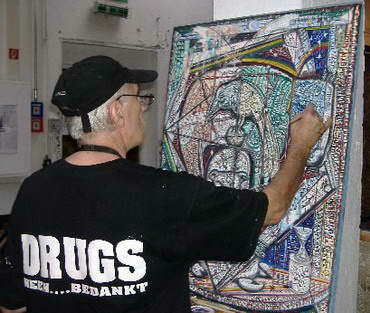 since 2001 a resident artist of Kunsthaus Tacheles, Berlin, Germany. Alexander Rodin's works are at the National Art Museum of Belarus, the Museum of Modern Art in Minsk, Belarus, Hasso-Platter Institute in Potsdam Germany and numerous private collections in Germany, Switzerland, the UK, France, the USA, Italy, Sweden, the Netherlands, Russia, Belgium and other countries.